© 2019 PT Studios Inc. 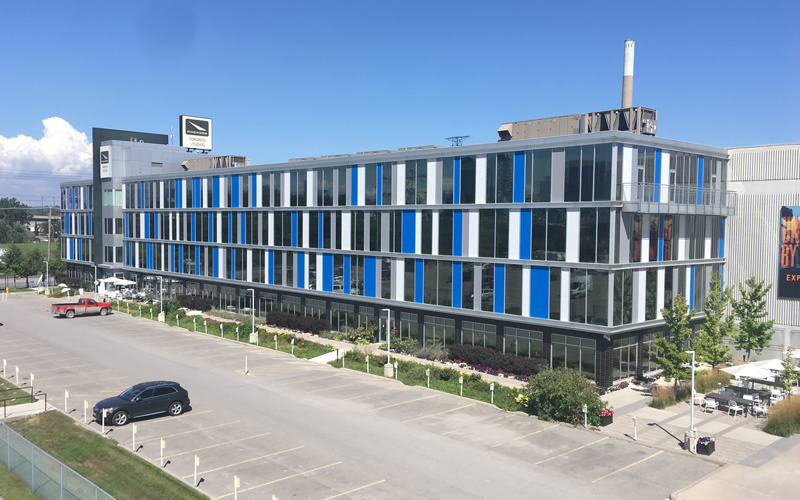 The Canadian Film Centre’s (CFC) Production Office has moved into new digs at Pinewood Studios Toronto. Here, we have joined a number of other thriving, award-winning independent production teams, such as CFC alumnus Mark Montefiore’s New Metric Media (which just opened an office in Los Angeles); Comedy Exchange Alumnus Andrew Barnsley’s Project 10, a production company with offices in Toronto and Los Angeles; Sheridan College’s partnership-based applied research department – Screen Industries Research and Training Centre (SIRT); and now Netflix has created a production hub at the Studios. "We're thrilled to welcome the CFC to Pinewood Toronto. The CFC plays an integral role in developing the next generation of Canadian talent, and as production in Toronto continues to soar, we are delighted to have the CFC as part our thriving community," says Paul Bronfman, Chairman of Pinewood Toronto Studios and CFC Board Member, who supported this opportunity. Pinewood Toronto Studios is the destination facility for domestic and international film and TV producers shooting in Toronto. Its 250,000 square foot, purpose-built production space is located on a 20-acre site with 12 stages, including North America’s largest purpose-built soundstage. Select recent successes made there include Shazam!, Star Trek: Discovery, Suicide Squad, Orphan Black, Scott Pilgrim vs. the World, Schitt’s Creek and Crimson Peak. Pinewood Studios Toronto, where CFC Productions will now have a permanent base. © 2019 PT Studios Inc. The CFC’s bright, beautiful, new offices will be the Production team’s permanent base. It will continue to offer CFC Programs a downtown satellite space that is fully accessible and an inspiring environment in which to support CFC’s talent, alumni, and our amazing volunteer cast and crews. One final note of gratitude: we are especially appreciative of Pinewood Group’s Sales Executive Erika McCormick, a former CFC staff member in the Development and Events Department, and the entire management team at Pinewood for their support in facilitating this new home and making the transition flow so smoothly. Our sincere thanks to everyone in Pinewood Studios. We look forward to the fruitful future productions, partnerships, collaborations and connections that this new space will foster.